Posts Tagged "Intercessions for Sunday Before Lent Year C"
Almighty Father, whose Son was revealed in majesty before he suffered death upon the cross: give us grace to perceive his glory, that we may be strengthened to suffer with him and be changed into his likeness, from glory to glory; who is alive and reigns with you, in the unity of the Holy Spirit, one God, now and for ever. Amen. Moses came down from Mount Sinai. As he came down from the mountain with the two tablets of the covenant in his hand, Moses did not know that the skin of his face shone because he had been talking with God. When Aaron and all the Israelites saw Moses, the skin of his face was shining, and they were afraid to come near him. But Moses called to them; and Aaron and all the leaders of the congregation returned to him, and Moses spoke with them. Afterwards all the Israelites came near, and he gave them in commandment all that the Lord had spoken with him on Mount Sinai. When Moses had finished speaking with them, he put a veil on his face; but whenever Moses went in before the Lord to speak with him, he would take the veil off, until he came out; and when he came out, and told the Israelites what he had been commanded, the Israelites would see the face of Moses, that the skin of his face was shining; and Moses would put the veil on his face again, until he went in to speak with him. The Lord is king: let the peoples tremble; ♦ he is enthroned upon the cherubim: let the earth shake. The Lord is great in Zion ♦ and high above all peoples. Let them praise your name, which is great and awesome; ♦ the Lord our God is holy. Mighty king, who loves justice, you have established equity; ♦ you have executed justice and righteousness in Jacob. Exalt the Lord our God; ♦ bow down before his footstool, for he is holy. Moses and Aaron among his priests and Samuel among those who call upon his name, ♦ they called upon the Lord and he answered them. He spoke to them out of the pillar of cloud; ♦ they kept his testimonies and the law that he gave them. You answered them, O Lord our God; ♦ you were a God who forgave them and pardoned them for their offences. Exalt the Lord our God and worship him upon his holy hill, ♦ for the Lord our God is holy. Since we have such a hope, we act with great boldness, not like Moses, who put a veil over his face to keep the people of Israel from gazing at the end of the glory that was being set aside. But their minds were hardened. Indeed, to this very day, when they hear the reading of the old covenant, that same veil is still there, since only in Christ is it set aside. Indeed, to this very day whenever Moses is read, a veil lies over their minds; but when one turns to the Lord, the veil is removed. Now the Lord is the Spirit, and where the Spirit of the Lord is, there is freedom. And all of us, with unveiled faces, seeing the glory of the Lord as though reflected in a mirror, are being transformed into the same image from one degree of glory to another; for this comes from the Lord, the Spirit. Therefore, since it is by God’s mercy that we are engaged in this ministry, we do not lose heart. We have renounced the shameful things that one hides; we refuse to practise cunning or to falsify God’s word; but by the open statement of the truth we commend ourselves to the conscience of everyone in the sight of God. 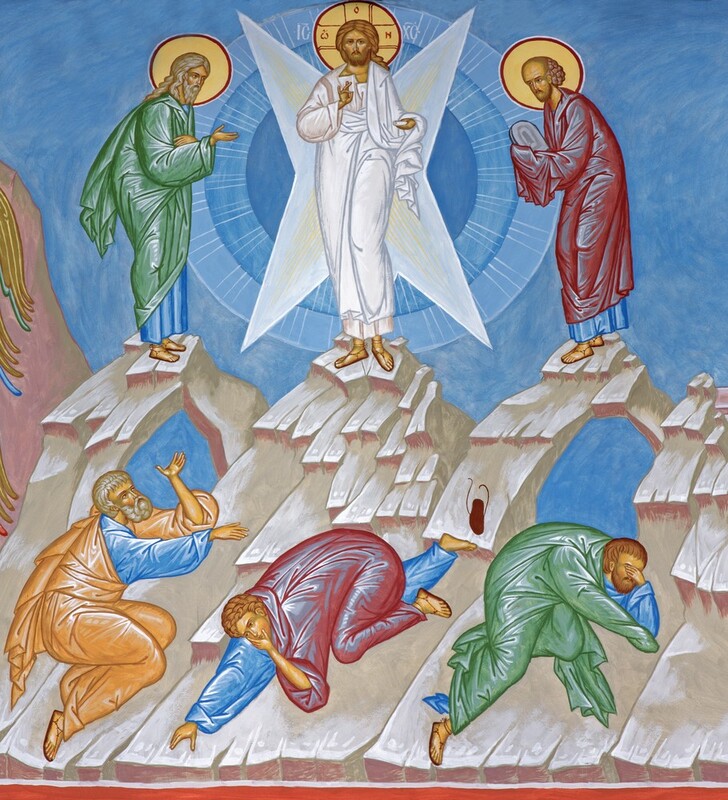 Jesus took with him Peter and John and James, and went up on the mountain to pray. And while he was praying, the appearance of his face changed, and his clothes became dazzling white. Suddenly they saw two men, Moses and Elijah, talking to him. They appeared in glory and were speaking of his departure, which he was about to accomplish at Jerusalem. Now Peter and his companions were weighed down with sleep; but since they had stayed awake, they saw his glory and the two men who stood with him. Just as they were leaving him, Peter said to Jesus, ‘Master, it is good for us to be here; let us make three dwellings, one for you, one for Moses, and one for Elijah.’ Peter did not know what he said. While he was saying this, a cloud came and overshadowed them; and they were terrified as they entered the cloud. Then from the cloud came a voice that said, ‘This is my Son, my Chosen; listen to him!’ When the voice had spoken, Jesus was found alone. And the disciples kept silent and in those days told no one any of the things they had seen. On the next day, when they had come down from the mountain, a great crowd met him. Just then a man from the crowd shouted, ‘Teacher, I beg you to look at my son; he is my only child. Suddenly a spirit seizes him, and all at once he shrieks. It throws him into convulsions until he foams at the mouth; it mauls him and will scarcely leave him. I begged your disciples to cast it out, but they could not.’ Jesus answered, ‘You faithless and perverse generation, how much longer must I be with you and bear with you? Bring your son here.’ While he was coming, the demon dashed him to the ground in convulsions. But Jesus rebuked the unclean spirit, healed the boy, and gave him back to his father. And all were astounded at the greatness of God. Everyone was amazed at all that he was doing. In the passage from 2 Corinthians, Paul is referring directly to today’s reading from Exodus. But his take on the story is eccentric in the extreme. In Exodus, there is no suggestion that the people of Israel are to be blamed for the veiling of Moses’ face. It is natural that the after-effect of an encounter with God should be so dazzling. But Paul implies that the veil is a sign of the Israelites’ determination not to see what is offered to them. He suggests that they deliberately choose to put a barrier between God and themselves, and that that barrier remains until Jesus removes it…. he is exhorting his readers not to copy the Israelites by choosing to ‘veil’ things… Subterfuge and deceit are ‘veiled’ things. Christians live with the open truth. Let us pray to the Father, who has revealed his glory to us through his Son. Lord, we pray for all those who govern the nations of the earth yet seem almost wilfully blind : grant to them all a glimpse of your glory, that pearl of great price. Come to those whose vision is veiled by material cares, and give them light. To all those charged with leadership of nations and institutions, give them hope that the future does hold possibilities, if they do but search for them. Lord, pour out your transforming love on all who long for release from their sufferings. Give them peace and bless them with hope. Guide them into your sanctuary, especially all those whose suffering is hidden from the world and unimagined by the rest of us. May they now behold your glory unfurled in the eternity of heaven. ** based on a prayer from Stephen Cherry’s ‘Barefoot Ways’.